This weekend was a bit of a special one. As I’m sure you are aware Murr has been preparing for a wedding, well this weekend it was wedding time! On Friday night, we all met up as we were all staying at our friends house. We popped out for a few drinks and a bit of grub, nothing to serious. Then we headed back to our friends, played a little Fifa and WWE. But went to bed relatively early to make sure we were fresh for the next day. Saturday came along, and we all got up way to early, and pretty much just hung around chatting for most of the morning. Mainly checking to see if Murr was doing alright, he was! Once we all were ready, we jumped in the car and made our way to the venue. 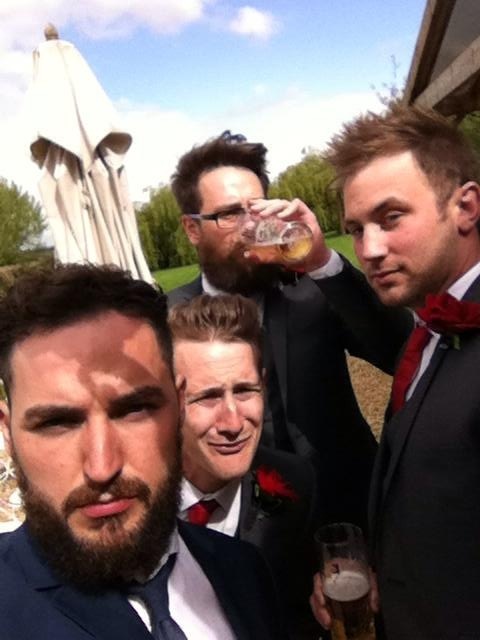 The Grooms Party Getting Ready! Once at the venue, it was just about knowing what we needed to do, which was mostly usher people around. Guests started arriving, and Murr was getting more and more nervous as the minutes ticked by. With the venue nice and full, it was time to take out seats, we had been informed that the bride had arrived, and that we were pretty much ready to go. Even I felt nervous at this point so I don’t know how Murr was feeling. Everything went off without a hitch, and we welcomed the new Bride and Groom. I was still bricking it though, because I knew I still had to my speech just before we ate. This speech has been worrying me for a few weeks now. Was it funny enough? Was it suitable? Was it long enough… etc. etc. Once the photos and a few drinks and canapés were done, it was crunch time… for me. Father of the Brides speech was first *thump, thump* went my heart *Murrs speech was next *THUMP, THUMP, THUMP* I was pretty sure my heart was now beating hard enough for people to hear it. Thankfully, so I’m told, it was a pretty good speech. I managed to not screw it up, I got some laughs, and got through it. Time to relax. The wedding venue was next to what is basically a big adventure playground, and at 6PM this got opened up to all the wedding guests got an hour. Give adults a few drinks, and they quickly become big kids. It was so much fun climbing around, diving in ball pools, going down death slides. It was something I’ve never encountered at a wedding, but it was awesome. The rest of the night was spent partying. All in all, it was a brilliant day, and now Murr is off for 2 weeks on his honeymoon in Mexico, lucky git! So, yea, a slightly different Geekly Review this weekend. But a pretty big one for us! Normal service will be resumed soon. BACK TO THE GAMING! April 28, 2014 in Random.